From preschools to universities, light quality has both a seen and unseen impact on those underneath them. 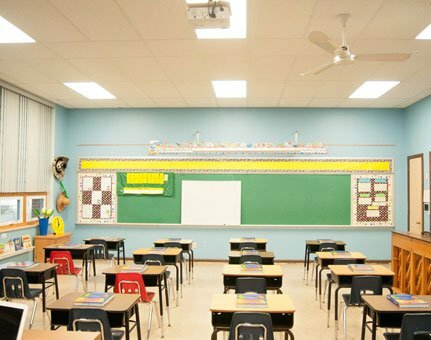 On one hand, LED lighting has been shown to help increase reading comprehension and accuracy, as well as improve student work habits and academic performance. On the other hand, crisp outdoor LED lighting can help make students and faculty feel safer, while its longevity and reliability reduces energy and maintenance costs, allowing funds to be spent on more direct educational initiatives. Ultra-efficient LED downlights in hallways, cafeterias, and bathrooms ensure clear lines of sight that allow students and visitors to move with confidence, all the while boosting mood and energy savings. Once the late-night sports games or study sessions end, LED parking/area lights promise safe and secure environments for visitors and students, with bright, consistent light in parking lots, parking decks, and outdoor walkways. Designed for high ceilings, LED high bays eliminate any need for maintenance in gyms, ensuring no surprise interruptions during sports events or presentations, all the while reducing maintenance costs for institutions and taxpayers by up to 70 percent. LED troffers/flat panels’ uniform, crisp white can help improve academic performance in classrooms and dorm rooms, allowing students to read, study, and take notes with ease. Positive attitudes increase, while fatigue and energy costs plummet. Reliable LED exit and emergency lights above doorways make it easy to identify exit and entry points, especially in the event of a hazard.